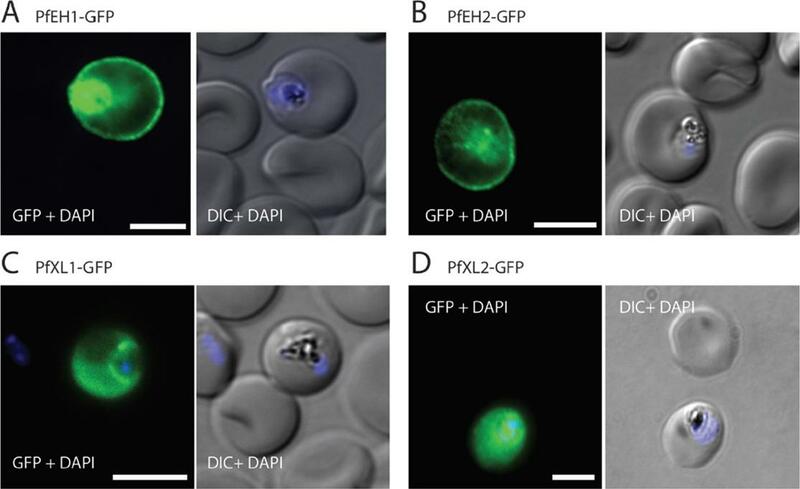 PfEH1 and PfEH2 interact with the erythrocyte cytoskeleton. IFA of paraformaldehyde/ glutaraldehyde-fixed, trophozoite/early schizont-stage parasites expressing PfEH1-GFP (A) or PfEH2-GFP (B) under control of the respective endogenous promoter. 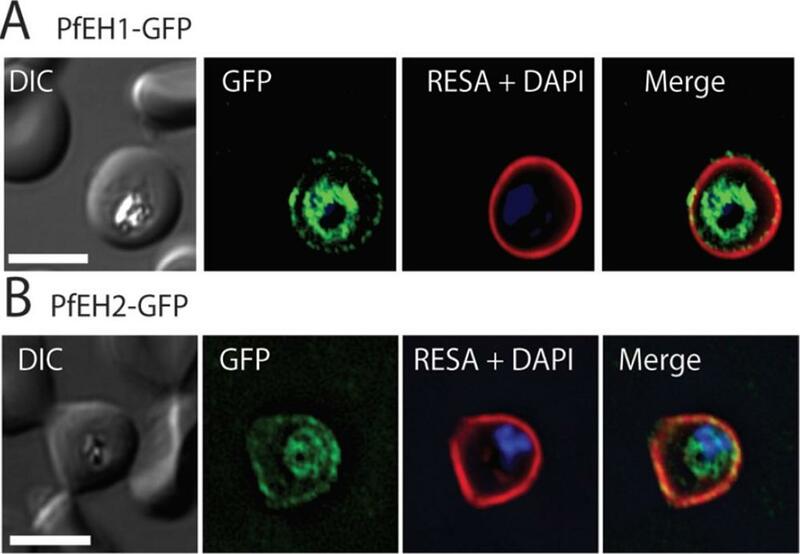 The GFP-expressing parasites were costained with anti-RESA (red). The nuclei were stained with DAPI (blue). Bars = 5 mm. DIC, differential interference contrast. In asexual parasites, anti-GFP antibody detected PfEH1 and PfEH2 at the periphery of the infected erythrocyte and within the parasite. The fluorescence at the periphery colocalized with ring-exported surface antigen (RESA), an exported protein that interacts with host spectrin at the RBC cytoskeleton.Spillman NJ, Dalmia VK, Goldberg DE. Exported Epoxide Hydrolases Modulate Erythrocyte Vasoactive Lipids during Plasmodium falciparum Infection. MBio. 2016 Oct 18;7(5). pii: e01538-16. Four a/b-hydrolases are exported into the erythrocyte compartment. Immunofluorescence assay (IFA) of trophozoite/early schizont-stage parasites overexpressing GFP-tagged a/b-hydrolases. Parasites were fixed with paraformaldehyde/glutaraldehyde and stained with anti-GFP (green). The nuclei were stained with 4’,6’-iamidino-2-phenylindole (DAPI) (blue). (A) PfEH1-GFP, (B) PfEH2-GFP, (C) PfXL1-GFP, and (D) PfXL2-GFP. Expression was under control of the constitutive HSP86 promoter. The images are representative of at least three independent experiments. Bars=5 mm. DIC, differential interference contrast. 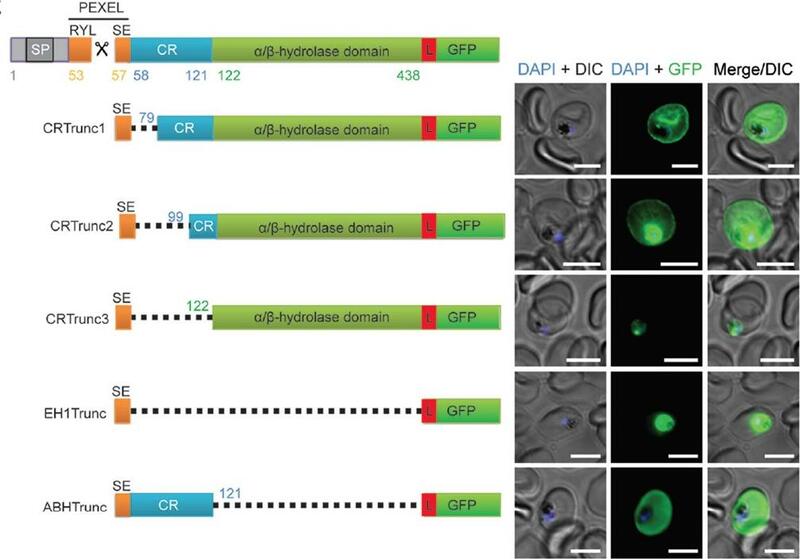 For the two a/b-hydrolase familyA members, fluorescence was observed at the periphery of the infected erythrocyte and within the parasite (A and B). In contrast, for the two family B members, fluorescence was diffuse throughout the cytosol of the infected RBC (C and D).Spillman NJ, Dalmia VK, Goldberg DE. Exported Epoxide Hydrolases Modulate Erythrocyte Vasoactive Lipids during Plasmodium falciparum Infection. MBio. 2016 Oct 18;7(5). pii: e01538-16.